Top 10 frequently asked questions about implementing DOCSIS within Hospitality Industry – We have moved – Follow us on www.telestehub.com! I spend a lot of time talking to integrators and hotel owners discussing the subject of utilising their existing coax cabling. To many this is a totally new concept, that coax can be more than just delivering TV pictures, but very quickly the conversation accelerates towards a host of questions, as the benefits become clear. I have made a summary of the most frequently asked questions. I am sure you will be nodding your head in agreement as you read through the questions and answers below. A conventional data network requires installation of Ethernet cabling. Re-cabling a building can be very costly, time consuming and disruptive. In older properties that are protected or have asbestos, it even might not be a possible option. Coax cable has none of the limitations of CAT cables – it can be split, tapped, extended and amplified with virtually no limitations on distance. 2 – Is my coax network too old or good enough? The simple test is, can I go into a room in your hotel, switch on the tv and see all of the channels you provide? If so, then your network is already capable of using DOCSIS downstream signals. This is because the DOCSIS signals have exactly the same requirements on the network as normal TV channels – same signal levels and noise immunity. So what about the upstream signals when I want to send data back to the network switch? The upstream signals use the very lowest part of the TV spectrum where there are not any broadcast channels. This is the most robust and reliable part of the spectrum. 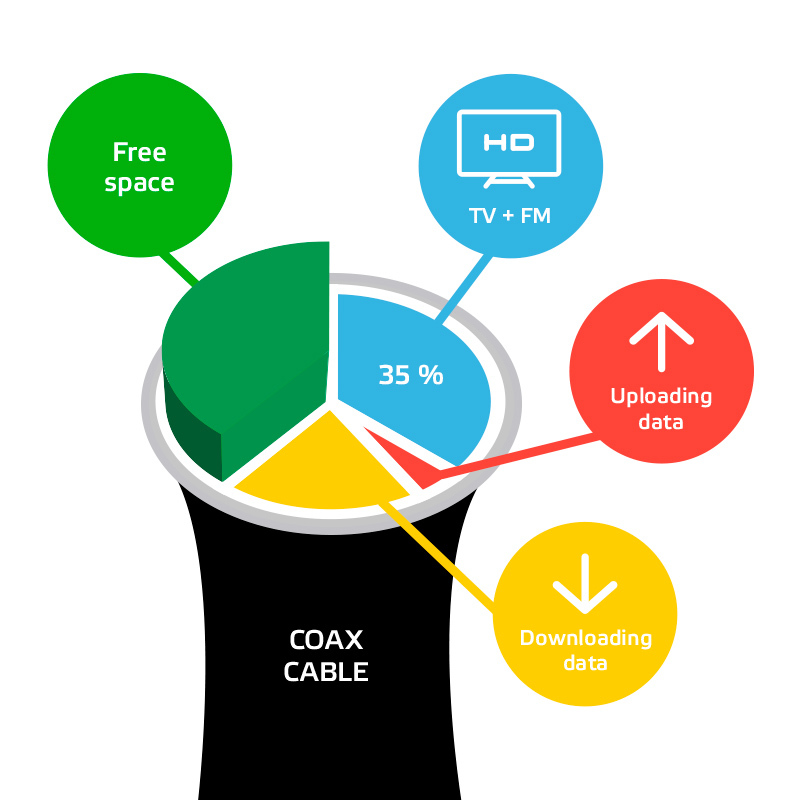 We already know the coax network is good because we can receive Downstream TV signals over it. All we are now doing is sending signals the other way at a lower frequency. This is how the very first Coax based Computer networks operated long before CAT cables were even thought of. 3 – Will I need to change my amplifiers? If the existing ones are old, it’s likely that the key components are wearing out and are working inefficiently anyway. (noisy, leaking capacitors, power supplies fading away, amp turned up to 10 etc.). Most standard amps are Downstream only (Antenna to TV), and down cover the low frequency upstream signals. The good news is amps are inexpensive and there are only a handful of them in each property. Often installing new more efficient amps reduces the amount of actual amps required. Just as your current channel lineup is spaced out to avoid interference, the DOCSIS Downstream channels fit into some of the unused spaces. The DOCSIS channels use the same signal format and levels as normal TV and do not cause any interference. 5 – I have a lot of TV channels already, is there enough space to add DOCSIS? Even a fully populated TV channel lineup filled with HD channels, some FM radio and even a few old analogue local channels thrown in, still has more than enough space in the spectrum to add the DOCSIS channels and leave room to spare. Our Web GUI enables you to manually or automatically set and arrange the new channels. 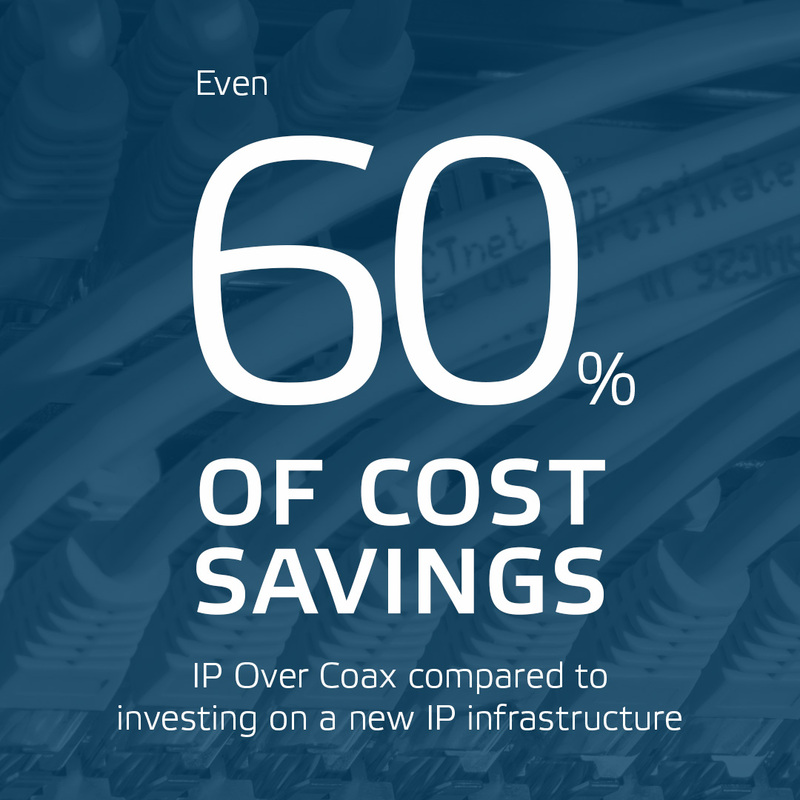 Your existing COAX cable is just like a pipeline that is only 35% full. It can carry all of your guests internet data as well and still have plenty of space for future expansion. 6 – Will my coax network need to be replaced? The coax cable will be fine. It’s tough and reliable with plenty more years of service ahead. Most coax systems we see usually have one or two major network problems, hiding in their cupboards. These are usually taped together joints in the coax, where someone once accidentally cut the cable, and used the resources they had to hand, to fix the TV system before anyone noticed. The other big problem, is poorly fitted connectors that are loose or the wrong size for the cable type, sometimes even having tape to hold them in place! Often these are found connected to amplifiers, because the original professional amplifier failed, and was replaced by the maintenance man, with something bought from the local electrical or consumer store. If the cabling didn’t reach, or the connectors were the wrong sort, extra pieces are added to join it all up again, causing all sorts of issues with the signals and interference across the system. 7 – Can I get a Gigabit connection to every room just like CAT5? DOCSIS carries up to a Gigabit over the Coax. When you look at the size of the data pipe coming into the property (typically 500 Mbps), there is more than enough capacity in the DOCSIS network. 8 – What about IPTV? Surely this needs lots more bandwidth. We have worked hard to develop our DAH mini CMTS to be fully Multicast IPTV compatible. In simple terms, no matter how many devices are watching the IPTV channel it only needs to exist once on the network. Typical HD IPTV channels are 10 Mbps. 500 Mbps internet traffic, assuming the pipe into the building is being 100 % utilised at that moment. 9 – Do I need to change the cabling in the room? From our years of experience we would recommend changing the fly leads/RF jumper cables in the room – the cable that goes from the wall outlet to the TV. This is because they are old, usually with loose connections (causing excessive noise on the TV signals), often with physical damage where they have been crushed up behind a TV screen. You wouldn’t tune up your car engine and leave the worn out old types on it, would you? 10 – Is there a recommended type of Flylead/ RF jumper cable? Cables that were designed to be robust and properly shielded against noise- just like your cable TV provider uses. They have better, tighter fitting connectors (more reliable) the copper braid (the part of the coax cable that provides the shielding element of the coax cable design) is actually bonded to the cable. This means that when the cable bends, the braid does not move and separate, causing noise and signal loss. I am the Director of the Hospitality & AV business unit within Teleste, where we focus on selling Teleste Solutions to enable Video and Data distribution. I have over 20 years of sales experience in the AV industry, and have seen the industry grow from basic screens and projectors, into the exciting and innovative solutions that we see today. 11 years ago I became involved in the Cable TV industry where I have seen the IP over coax technology spread from Telco and Cable TV operators, into Hospitality and home distribution networks. The ever increasing demand from consumers for faster Internet access, is something that Teleste live and breathe every day, in order to continually exceed the demands of our customers by offering a faster, safer and smoother delivery of their internet data and video content. I am also a frequent traveller and hotel guest, so I am all too aware of the challenges faced by hospitality guests, when they need Wi-Fi and connectivity. Whether that is for business communication or keeping your teenage children happy on family holidays.